It was interesting to see these on Friday on the way home and have one for dinner yesterday. Saturday started off really early for me - I needed to take Kelsie to pick up concert tickets to Fall Out Boy because I am the coolest mom. I don't mind if she goes to concerts as long as someone is going with her, they are semi local (although I did let her go to a concert in Boston that I picked her up from) and for the most part that she pays for herself. This one fit that bill so I said yes. Plus the concerts that she wants to go to are never more than 40.00. Then Mary and I need to run some errands - and along the way we stopped at a small family run restaurant in Salem, NH named Priscella's where I had the banana split waffle and Mary had steak tips. Very good food and extremely fresh. We ended the day at the Christmas Tree shop where Mary decided that she would do a little modeling for me. On Friday afternoon, C and I took Kathy out to lunch for her birthday. We went to a cute little place near where I work named Sato’s. Good Chinese food. We had a very nice lunch and conversation. Then on Saturday night, Mary, Kathy and I went out again for her birthday to Bollywood in Lexington. Very small place – lots of people in for take-out. I would eat there again and apparently so would Mary (this was Mary’s first time eating Indian food) but I think I would suggest taking it home. Very yummy Indian food. One of the places that we like to eat when we are heading north for the day is at MaryAnn's Diner in downtown Derry, NH. It is a fifty's style dinner with waitress' in poodle skirts and pictures on the wall and on the table. If you are ever in the area, maybe on your way to the Yarn and Fiber Company, you should stop in. Great food, great people and pretty good music too. 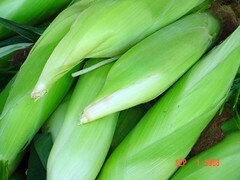 On Monday, Mary, Kathy, Jared and I all went to Tecce's for some corn. Now Mary swears that this is the BEST corn in New England. In fact one of the main reasons that we went is because my MIL and FIL are having friends visit from North Carolina and they LOVE Tecce's corn. They are transplants from Vermont originally and are coming up to visit for a week or so and were dying for some corn, so because we are good doobies we went and bought them some. This is a little farm stand but boy was it busy and they had some wonderful looking and smelling veggies. Can't wait to have some. 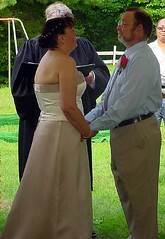 On Saturday afternoon, we were invited to a wedding of a lovely couple that we have met at the campground. They decided to tie the knot under a tent in the field at the camp surrounded by their families and friends (and some curious kids). 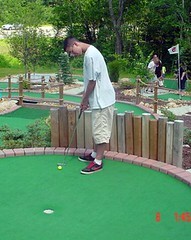 Thankfully the weather cooperated and it did not rain at 4 p.m. like it has every other day this past week. It was a great ceremony with lots of laugh, lots of hugs, lots of love. We wish them the very best as they start on this road of wedded bliss. This past holiday weekend, Mary and I went to our friends Penne and Elfi's house for a cook out on Saturday. Elfi has a wonderful green thumb and has many beautiful flowers in her garden. Here are a sample of them. I don't do a lot of cooking. Not that I don't like to but schedules prevent it for most of the time. 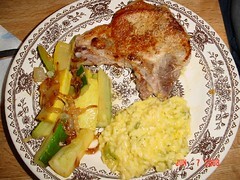 This past weekend Mary and I decided to eat at our camper rather than partake in the usual gathering (an experiment on our part due to some weird symptoms on my part), so we had a lovely meal of fresh zukes, summer squash and onion sauted, a bone in center cut pork chop and some broccoli/cheese rice. Quite yummy if I do say so myself. 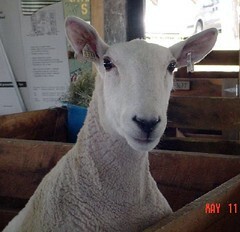 On Saturday, Mary, Kathy and I headed out to the New Hampshire Sheep and Wool. Now this is only my third time going and this is the first that it didn't rain. I love this festival. Not too crowded, lots of stuff to look at and lots of animals for Mary to take pictures of. They seem to like to pose for her. Check out her blog for some of her up close and personal pictures. On Sunday, Mary and I headed back to the festival as I was taking a class in Tricking out My Wheel. Winnie and I had a lovely time with Julie, Rose, and Danielle. I learned a lot of interesting thing about my wheel, mostly how to correctly take care of it. We also were able to chat for a bit with Lucia, Carol and on Saturday, we ran into Kathy and Manise. We had good fair food - yummy lobsta rolls and apple crisp, checked out the fleeces, purchased some roving and some yarn and a drop spindle for Mary and went home happy with the time spent together and with our purchases. OOOO and I also sent the first of many fleeces to be processed at Friends Folly Farm. A very satisfying weekend, all in all.